Mount Assiniboine Provincial Park encompasses 39,050 hectares and is part of the Canadian Rocky Mountain UNESCO World Heritage Site. Situated along the continental divide, it's jagged peaks, sparkling lakes, flowing glaciers and flowered alpine meadows make this wilderness scenery some of the most stunning in the Canadian Rockies. At the south east corner of Mount Assiniboine Provincial Park, at an elevation of 3,618 metres, Mount Assiniboine is world renowned. This is unspoiled wilderness, with no roads into the core of the park. Trails provide the only land access. Numerous trails wind their way through the park. They vary in difficulty and length, some being short, easy day hikes and others long, difficult overnight trips. The most popular hiking trails to the interior the park start from Kootenay National Park to the west, and from Spray Lakes via Bryant Creek (Banff National Park) located south of Canmore, from Sunshine Meadows west of the Banff townsite, in Banff National Park, Alberta. 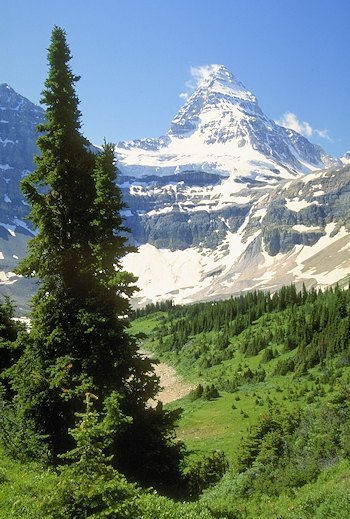 Mount Assiniboine Provincial Park is located northeast of Radium Hot Springs and west of the British Columbia-Alberta border 48 km southwest of Banff. Banff National Park, forms the eastern boundary, and Kootenay National Park, the western boundary. Camping, hiking, mountain climbing, wildlife viewing and the stunning mountain scenery are the main attractions here, as well as fishing, horseback riding. During the winter months, skiing in and out of the park on either tele-mark skis or alpine touring equipment is a popular way to see the area. The Vegetation consists of spruce, alpine fir, and lodgepole pine as well as patches of false azalea, buffalo berries, twinberries and white rhododendrons amongst many other spectacular species of flora. Hundreds of species of wildflowers are found here during mid-summer. Animals including the elk, black and grizzly bear, mule deer, moose, mountain goats, squirrels and chipmunks, marten and mink and coyote are found here as well as ninety-three species of birds.